This is what ended the Thanksgiving dinner last night. I had to come up with something, since my girlfriend doesn’t like pumpkin and I wasn’t sure if my father could eat pecans. 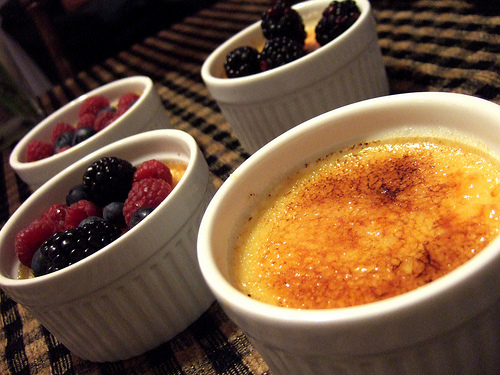 So, creme brulee! It’s always a hit and it’s simple to make. Preheat oven to 350 degrees. Place whipping cream and vanilla beans in a medium pot. Heat over medium-high until bubbles start to form on the surface, just below a boil. DO NOT boil, or the cream will break. Whisk the eggs and sugar together in a large bowl. When cream is ready, pour slowly and in a thin stream into the eggs, whisking continuously. Using a fine mesh sieve, strain the mixture into 8 medium-size ramekins. Place the ramekins in a baking dish and pour hot water into the dish until it reaches halfway up the ramekins. Bake for approximately 45 minutes, until the custard is set around the edges but still moves slightly in the center when shaken. Remove ramekins from the water bath to a towel and allow to cool. Once cool, cover and chill for 2-3 hours or overnight. When ready to serve, sprinkle approximately 1 tablespoon of sugar (or half white and brown sugar for a deeper flavor) over the top of each custard. If using a torch, start burning the sugar in the center and move outwards in a circular motion. If you don’t have a culinary torch, preheat a broiler. Place the ramekins on a baking sheet and then place them approxiately 4 inches from the broiler. Heat until the sugar carmelizes, approximately 5 minutes. Allow the sugar to cool and harden before serving. Serve plain or with assorted berries on top. I did all the chopping and prep the day before, and my 16 pound turkey cooked in 3 hours. Take that, Butterball! I laugh at your stupid directions. All hail Alton Brown! It’s only within the last few years that I decided I really like a good meatloaf. After some trial and error, this is one of the best I’ve come up with. Preheat oven to 350 degrees. Soak the bread in a tiny bit of milk and stir until it starts to fall apart. Sautee the garlic, onion, and green pepper until the onion is translucent. Stir into the bread crumbs and let cool slightly. Add the egg, brown sugar, 1 cup of the ketchup, and beef. Mix (with your hands, get over it) and then spread it into a 9×13 baking pan. Spread the remaining 1/2 cup of ketchup over the top and bake for approximately one hour. Remove from oven, pour off any grease that has collected (the meatloaf will have shrunken depending on the leanness of the meat). I’ve decided to make a giant pot of beef vegetable soup. I’ve never made it, and I have no clue what I’m doing, but hey! That’s never actually stopped me before. So . . . this is how I’m doing it. If I type something in here, it seems like I actually have a method. But let’s pretend. I’ve been looking up pho recipes lately, so I took a few tips from that on how to make a good broth. Throw the bones and meat into a pot, cover with water, and bring to a boil. Boil for 5 minutes and remove the meat to a colander. Throw out the water—there should be TONS of foam on top which supposedly contains a lot of impurities and the most fat. Rinse out the pot, rinse off the meat, then put the meat back in the pot and cover with 14-16 cups of water (approximately 4 quarts). Chop the onion and garlic. While the water is coming to a boil, quickly sautee the garlic and onion before adding it to the stock. I decided to do this to add a deeper flavor. Once the onion is transluscent, add the onion, garlic, and some chopped marjoram to the pot. Add some salt, pepper, and ground thyme as well. Bring to a boil, turn the heat down, and simmer on medium-high for about 2-3 hours. Using tongs or a slotted spoon, remove the bones and meat from the pot to a colander. Throw some ice into the stock and put it into the freezer so all the extra fat rises to the top and is easy to skim off. Pull the meat off of the bones and give it a rough chop. If you’ve done it right, the shank bones should now be hollow, since all the marrow will have cooked out into the stock. Skim the fat from the stock, bring it back to a boil, and add the tomatoes, green beans, carrots, and celery. Bring to a boil and simmer until the vegetables are tender. Add the meat back in toward the end. At this point, start testing the stock again for salt. If it needs anything, add it (so vague, I know). And that’s it! Yes, it takes all day. Because a good soup takes all day. It’s worth it, i swear. Molly swears she won’t make this soup any more because she’s burnt out. Me, though, I’m still good. I love this soup for so many reasons. 1 pack Italian sausage (I buy the links just in case I want it in slices on a given day. But I usually take it out of the casing anyway). Chop the onion and garlic and set aside. Stem the kale and tear into bite-size pieces, then rinse and strain. Break the sausage into pieces into a large soup pot and sauté briefly. When sausage is about halfway cooked, add the onion and garlic. Once the sausage is browned, add the kale and stir until it wilts. Add the chicken broth and a little bit of the spices and allow to simmer for approximately 20 minutes. Do not add a lot of the spices at this point–you need to allow the rest of the flavors to come together so you can tell what’s going on. After a bit, taste the broth. Add whatever you think it needs: red pepper, salt, pepper, thyme, marjoram, white wine . . . whatever! I usually stir in a little bit of half and half at the end to finish out the broth a bit. Molly likes to add diced tomatoes and whipping cream to hers. We agree that a little shaved Parmesan is great over the top. And there it is! A quick, wonderful soup that is healthy, fast, and yummy. 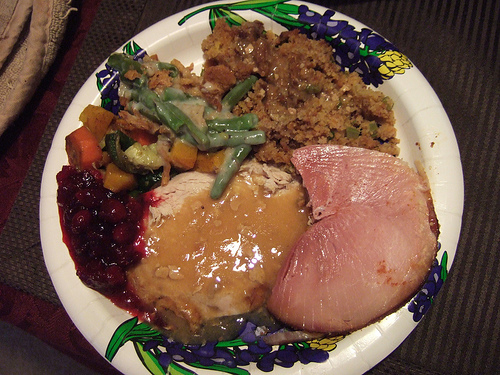 You are currently browsing the Fixin' to Eat blog archives for November, 2008.